The Nelson Brothers' Complete Geography of the World is an illustrative and descriptive explanation of their beloved imaginary world. The book contains maps of each continent and some illustrations even detail the agricultural production of each province within the continents. This book certainly helps readers gain perspective on the brothers' paracosm. 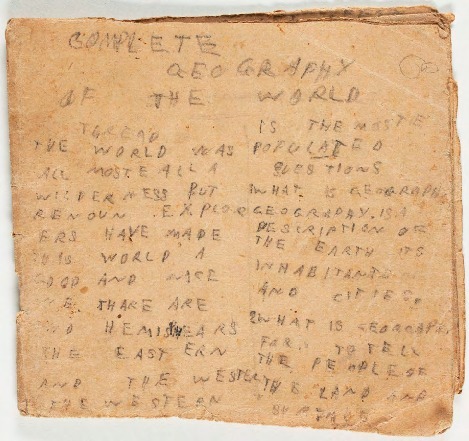 “Complete Geography of the World,” The Worlds and Works of the Nelson Brothers, accessed April 23, 2019, https://www.ats.amherst.edu/childhood/items/show/202.